Blues guitarist Sylvester Weaver bears the tremendous distinction of not only being an outstanding musician, but also a pioneer in the field of recorded blues, with his historic records impressing on artists so far and wide as Bob Wills’ Texas Playboys. Sylvester Weaver was born on July 25 in either 1896 or ’97, in Louisville, Kentucky. Most details surrounding his early life are lost to the march of time, but it is quite conceivable that he might have been involved in the rich jug band culture surrounding Louisville, which included groups led by Earl McDonald and Buford Threlkeld, better known as Whistler. In 1923, he traveled to New York City with blues singer and fellow Louisvillian Sara Martin, who had been recording successfully for Okeh Records since the previous year. With Martin, Weaver recorded on October 24, 1923 what may have been the earliest vocal blues backed by a single guitar. He followed with his own first solo record the next month: the instrumentals “Guitar Rag” and “Guitar Blues”, which some suggest comprise the first country blues record by a male artist; though that position is contested, they probably are the earliest solo “country” blues guitar instrumentals, and they without question made an indelible mark on musical history. Weaver ultimately recorded twenty-five or twenty-six sides between 1923 and ’25, sometimes in New York, sometimes in St. Louis and Atlanta when Okeh made field trips to those cities, before taking a hiatus from his recording career. His triumphant return came in April of 1927, when he returned to New York with Sara Martin once again to make another series of records. He continued to record throughout the rest of that year, sometimes joined by fellow guitarist Walter Beasley, and often in accompaniment of singers like Martin or Helen Humes, as well as waxing a few vocal takes of his own. But in spite of his recording success, at the end of 1927, Sylvester Weaver returned home to Louisville, soon fading back behind the same veil of obscurity that surrounded his early years, and he died there on April 4, 1960. Okeh 8480 was recorded on April 13 and 12, 1927, respectively, in New York City. It was released that September. Both sides are instrumental guitar solos by Sylvester Weaver. Firstly, Weaver plays his famous “Guitar Rag”, his second recording of the signature piece—the original having been made in 1923—that would later form the basis for Leon McAuliffe’s even more famous “Steel Guitar Rag” as recorded by Bob Wills in 1936. 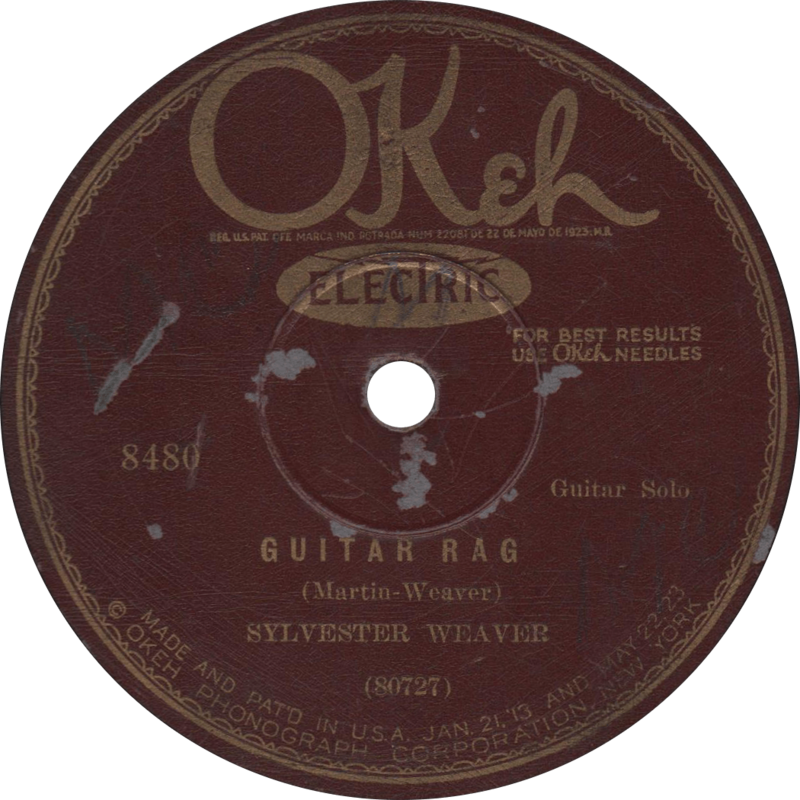 Guitar Rag, recorded April 13, 1927 by Sylvester Weaver. On the rather unusually titled rag piece “Damfino Stump”, Weaver plays six-string banjo-guitar, lending to a rather Papa Charlie Jackson-esque sound. One wonders if perhaps it was meant to be titled “Stomp” rather than “Stump”, though I prefer the latter, personally. Damfino Stump, recorded April 12, 1927 by Sylvester Weaver. This record is a surprisingly obscure one considering its excellence, even in light of its extraordinary scarcity. A Google search will yield precious few results, and the upload of the only side that’s on YouTube has accrued only around five-hundred views in more than half a decade. Its rarity earned it a spot on Document Records’ “Too Late, Too Late: Newly Discovered Titles and Alternate Takes” series rather than their Hokum Boys or Big Bill Broonzy series proper, and that may be the only commercial reissue it’s ever gotten (I’m not sure). To the few who know of it (mostly a small cadre of record collectors and blues researchers), it is held in high regard as perhaps Big Bill Broonzy’s best record. I had the fortune of being enlightened to its existence some years ago, and the even greater fortune of being able to acquire a copy. I hope to shed a much needed ray of sunshine onto this gem of prewar blues guitar, and help get it some of the recognition it deserves. In 1930, Big Bill Broonzy was under the management of Chicago “race music” impresario Lester Melrose, and playing good-time music with Georgia Tom and Frank Brasswell (or Braswell, a.k.a. “The Western Kid”) as the “Hokum Boys” (a mantle originally used by Georgia Tom and Tampa Red). Broonzy hadn’t recorded since his earliest, somewhat poorly received “Big Bill and Thomps” Paramount sessions of 1927 and ’28. Among the tunes recorded by Broonzy and the Hokum Boys were (fittingly) hokum titles like “Somebody’s Been Using that Thing” and “Eagle Riding Papa” (both of which were later covered by Milton Brown), urban blues novelties like “Mama’s Leavin’ Town”, and fast guitar rags like “Saturday Night Rub” and “Pig Meat Strut”. On the rags, Frank Brasswell’s flatpicked rhythm combined with Bill’s adept fingerpicking to make musical magic. The trio, occasionally including Delta blues man Arthur Petties, first recorded in New York for the American Record Corporation in various configurations and under various names, including “Sammy Sampson” for Bill’s solo work. Next they traveled to Richmond, Indiana to cut several sides for the Starr Piano Company’s Champion label, all ones they had made previously for the ARC, this time with Bill’s solo work credited to “Big Bill Johnson”. Those Champions were the last sides to feature Brasswell, who proceeded to drop off the face of the earth. Bill on the other hand would go on to great acclaim. 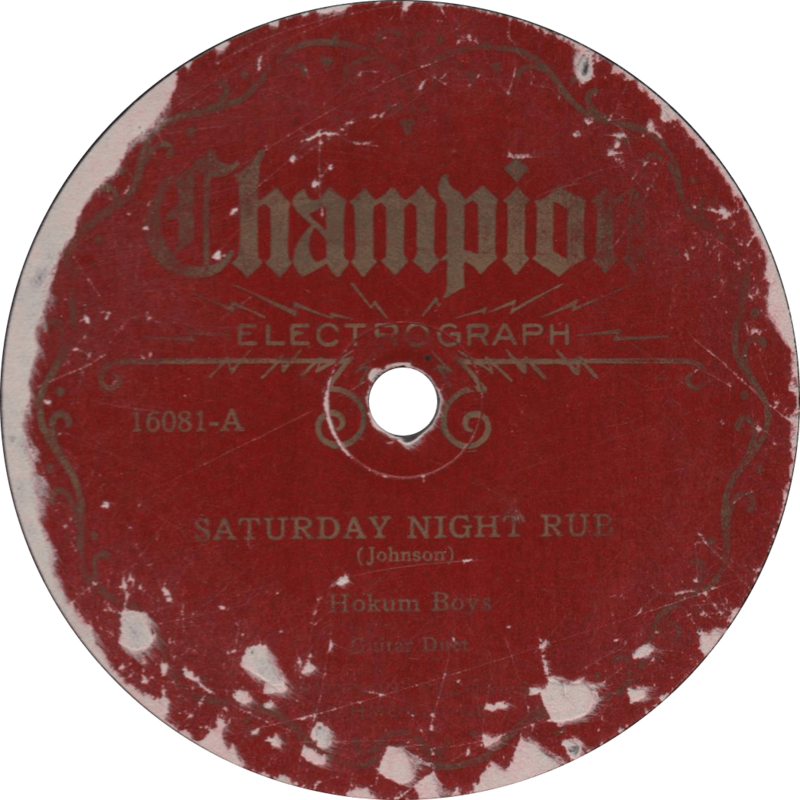 Champion 16081 was recorded on May 2, 1930 in Richmond, Indiana. The Hokum Boys are Big Bill Broonzy (recording for the Starr Piano Co. as “Big Bill Johnson”) and Frank Brasswell on guitars. It sold a total of 959 copies, of which only a handful are known to exist today. As such, it is listed in the “Rarest 78s” section of 78 Quarterly (issue number six), and while the total number of existing copies was not estimated at the time, a current estimate places the number at “fewer than ten known copies.” More popular versions of both tunes were recorded for the American Record Corporation the previous month (and both, in my opinion, are not near as good as these). There is some debate as to the correct playback speed for these recordings, with suggestions from my esteemed colleagues Mr. Russ Shor of Vintage Jazz Mart and Mr. Pete Whelan of 78 Quarterly ranging from the standard 78.26 RPM to 83 RPM. Based on an E chord on a guitar in standard tuning, my best estimate would be that they should play at approximately 80 RPM, to which I’ve set the transfers posted herein. Saturday Night Rub, recorded May 2, 1930 by the Hokum Boys. “Pig Meat Strut” on the “B” side is perhaps my favorite guitar instrumental (though there’s some stiff competition from Blind Blake, William Moore, Bayless Rose, Frank Hutchison, and others). Bill and Frank’s “Famous Hokum Boys” version of the rag for the ARC, recorded a little less than a month before this one, is often hailed as one of his best (I say phooey), but it sounds like a hot mess compared to this masterpiece! The riff used in “Pig Meat Strut” was seemingly ubiquitous in hokum of this era—such that I’d dub it the “hokum riff”—and appeared in a number of Broonzy and Brasswell’s other recordings of this era, later serving as the basis for Big Bill’s popular “Hey Hey” in 1951. Interestingly, a nearly identical melody was also used by Texas blues man Little Hat Jones in his “Kentucky Blues”, recorded only a month after this one, though any actual connection between the two is unknown to me. Man, did they get in the groove and how! 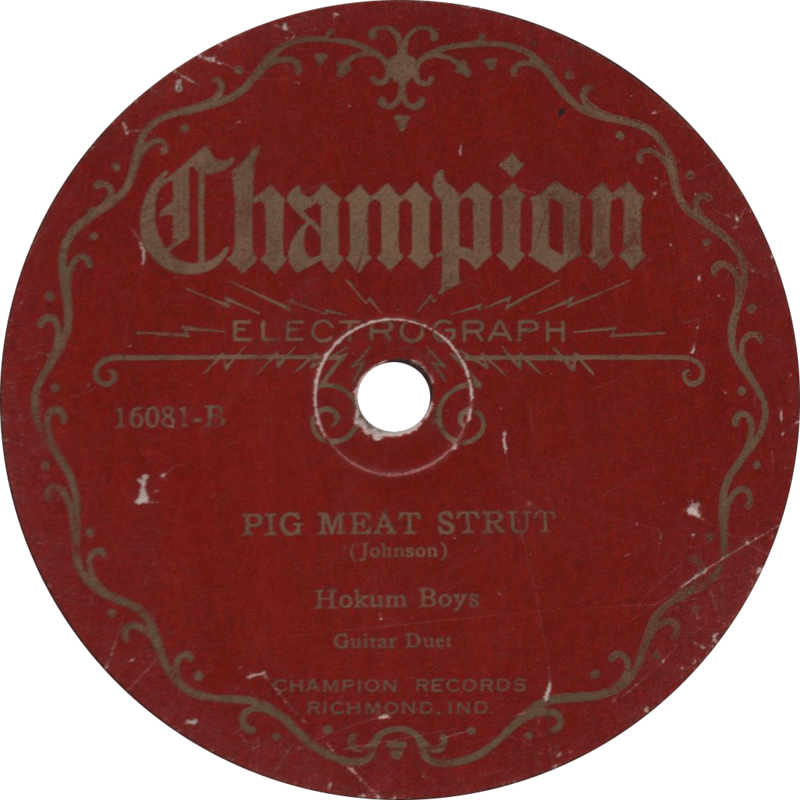 Pig Meat Strut, recorded May 2, 1930 by the Hokum Boys. Standin’ on the hill top, a dog began to bark. Well it was nothing but Stack O’ Lee come creeping in the dark.